The Lelit PL82T Kate marries aesthetics and functionality into one machine. 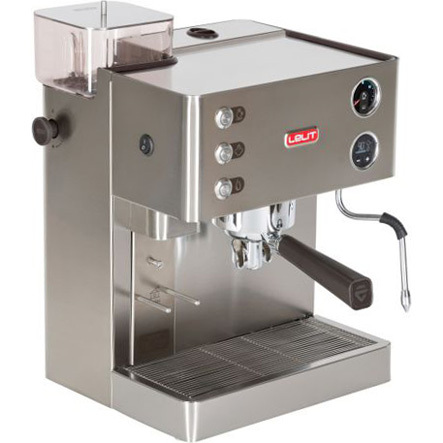 Its compact body combines an espresso machine of the highest level with a professional grinder. Equipped with the exclusive electronic Lelit Control Center (LCC), the PL82T Kate will astonish you with its performances and sophisticated charm. Brass – 300 ml boiler is made brass which retains heat better than stainless steel. Typically brass boilers are more susceptible to limescale compared to stainless steel boilers. We highly recommend utilizing the water softener included with the machine. Quick warm up time – From a cold start, it takes approximately 2 minutes for the machine to reach its set temperature at 200 °F (93 °C). Before this time, the machine modes will not function. It will take another 5 minutes for the rest of the machine (grouphead & portafilter) to fully heat. Built-in 38mm conical burr grinder. Stepless Grind Adjustment – Micro-metrical stepless grinding settings allows the user to make finite adjustments to grind size. Providing endless possibilities to make the perfect cup of espresso! Portafilter can attach to notch for hands-free dosing directly into the portafilter! Programmable timed dosing for single or double on LCC. of the machine and allows you to adjust the settings, but also gives valuable tips on how to achieve the best results. Temperature adjustment – Ability to program desired temperature for coffee, hot water, or steam dispensed. Shot timer – Timed based dosing of single and double shots of espresso. Preinfusion -Enable or disable preinfusion of coffee grounds. Grinding times – Time-based dosing of grinding single and double shots. Low Water Levels – LCC alerts when water levels are low in the reservoir. Stainless steel, push button switches with backlights when engaged. Wide water tray in stainless steel complete with self-cleaning grate. Instantly dries the grounds into a solid puck in the portafilter after brewing–making clean up super easy! Efficient – 41 watts, rated up to 15 bar with air valve bypass. Only 9 bar is needed to extract espresso, and wattage has no correlation to longevity. Cost effective – Pumps will degrade in performance over time. Replacing a vibration pump will be less costly than a rotary vane pump. Particle filter – Protects the machine from any unseen particles from entering the boiler. Can be removed if you are installing an inline water softener. Auto-shut off – In order to prevents burning out the heating element, the water tank sits on a spring activated plate. Once the water is low, the plate depresses the tank microswitch which turns off the heating element. Multi-directional – Allows for more movement and flexibility. The wand is equipped with a rubber grip which helps you position the wand without burning your fingers. 1-hole steam tip – Allows for maximum steam power. Rotational knobs – Located on the right side of the machine. Allows for easier control of the intensity. Backlit Brew (pump) pressure gauge – Located above the LCC. Measures between 0 – 16 bar. The optimal range is between 8 – 12 bar. Portafilter – 1 dual spout portafilter with Lelit’s distinct Coffee Slide design. Coffee slides towards the front of the portafilter versus the sides, like traditional portafilters. The handle is designed with an angle which allows it to rest on a flat surface. This eliminates the need for a tamping station. The Lelit logo is imprinted on the portafilter head and handle. Filter baskets – 1-cup filter basket which holds approximately 7 grams. 2-cup filter basket which holds approximately 14 grams. Blind filter basket which is used for backflushing. 58 mm in diameter. Tamper – A cheap plastic tamper, common for most espresso machines to keep overall selling price of machine low. We recommend upgrading to a better tamper. Scoop – Simple plastic scoop if using preground coffee. Water softener – Helps reduce limescale buildup in your machine. Highly recommended to the replace the existing particle filter and install this water softener. Instructions can be found in the Support tab. Instructional manual – Written in 7 different languages (English, Italian, French, German, Spanish, Romanian, Russian). Instructions also work for the Lelit PL81T Grace.